We always enjoy seeing your home made creations. Well done lads on your Conch Charters attire! 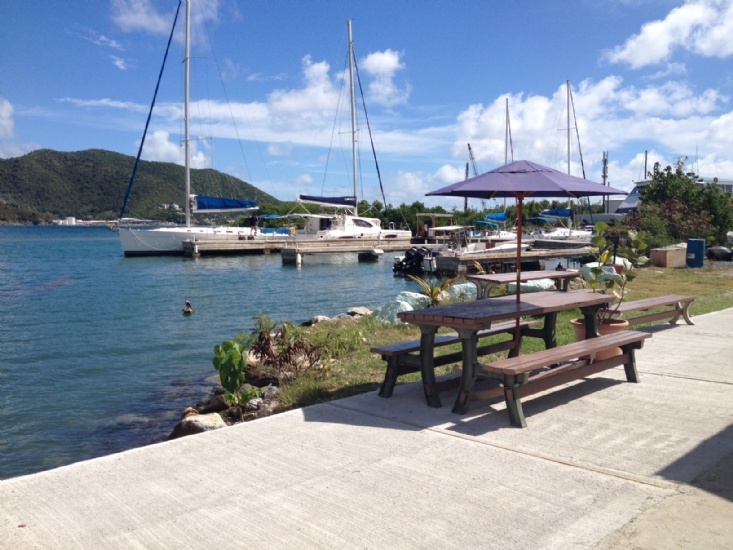 The British Virgin Islands have become ever increasingly popular as a sailing destination. I was made even more aware of this at this year's United States Sailboat Show in Annapolis. It was great to see and meet you all there despite the chilly conditions and the blue lips! We had a great show! That being said, we have spent our 'down time' this September improving our facilities to make a more comfortable dockside stay for you at the start and end of your charter. We even managed to get a picture of Ross sporting his Conch Charters Cap while hammering away! The start of the new season brings with it many exciting changes, one of which is the reintroduction of our Beneteau 40CC to the fleet. Give us a call to book your next charter on this 2cabin 2head vessel or any of the others in our fleet. And if you still need more enticing… Click here to see more of 'Nature's Little Secret'. Here is your opportunity to brush off the cobwebs from those cowboy boots and head down to the islands for VISAR's (Virgin Islands Search and Rescue) Wild West Gaming fundraising night. Can't make it but would like to contribute to this amazing non profit organization? Click on the link below to make a donation. Been to the BVI's many times or is it your first time? Let this month's featured Best BVI Activity put you high up in the clouds… literally! Antilles Helicopter Services started operating in the BVI a couple of years ago and offer a great service with a friendly smile. Their services include Scenic flights around the Islands, VIP Charter Services and Airport Transfers. This month's conch-clusion offering you some food for thought… instead of jumping on the ferry to get to Tortola from St Thomas for your next charter… why not let these guys fly you to the BVI in style. Or you can just treat yourself to the best vantage point of the islands, with or without the doors on! Shake well over crushed ice and pour into an 'old fashioned' glass. Garnish with orange and cherry then go and 'Find a Hammock'. There is a National Park site just off Pelican Island where four rugged and highly visible rocks stick out of the water. They are awesome for snorkeling and diving. What is the name of this Site? The Beneteau 343 is a perfect yacht for a couple, easy to sail with two people but with sufficient space to accommodate four. The Beneteau 343 has two double cabins; the aft cabin is larger than the forepeak. Both cabins have fans to keep you cool at night with sufficient storage for your personal items. The aft cabin is accessed via the galley which leaves room for a very spacious head with a separate shower. The galley is fully equipped with everything you will need to make delicious meals onboard, including a refrigerator. If you prefer to cook al fresco there is a charcoal BBQ. The spacious cockpit has plenty of room for four people to sit comfortably in the shade of the bimini. You can swivel the wheel whilst at anchor or on a mooring to allow easy access to the swim platform. The swim platform has a boarding ladder and shower. The main sail is a battened main with lazy jacks and stack pack, the jib is roller furling. For your entertainment there is a stereo radio with CD player. We are running out of your Conch Cap Pictures from around the world. If you have any pictures striking a pose whilst wearing your Conch Cap/Attire or even just relaxing in a hammock on the beach somewhere… please send them our way. We love hearing from you all!